Nick’s friend Harrison joined us for cowboy casino night. Hubba made the yummiest cowboy nachos, and was the bank the whole night. so Nick lost 15-20 pounds to qualify for the Jr all American team. Now that the season is over he indulges once in awhile. Today he had a man size burrito. One of his favorite football players was recorded during a game saying I eat burritos bigger than you to an opposing player. Nick got a kick out of it, and Hubba reminded him of that quote which made Nick shake his head and laugh. Tony had a party at a Yacht club to go to tonight for Police Explorers. 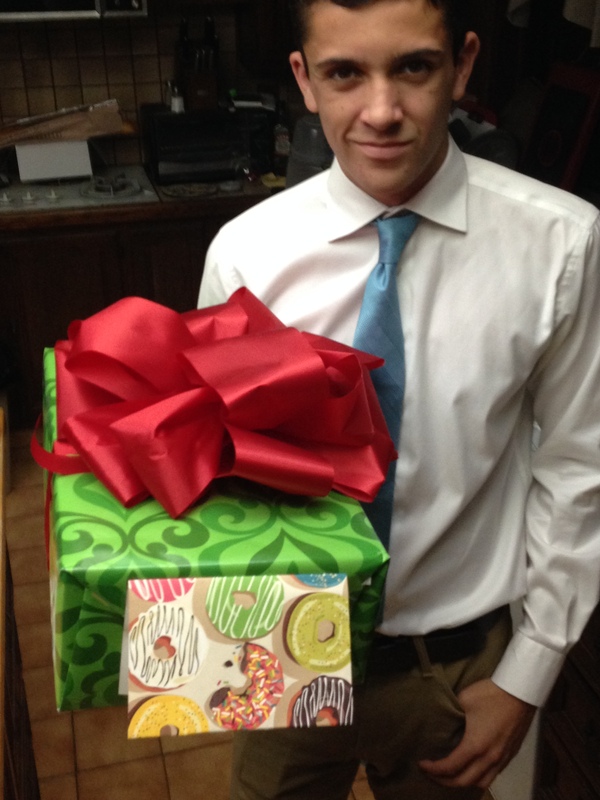 There was a gift exchange to so because it’s police explorers and police like donuts, we added a donut card. (man I think I’m hilarious, someone has too) Got there on time….I pulled into the parking lot and was staring squarely at a brand new, no plates, Rolls Royce, had tony jump out of the truck and tried to back out VERY CAREFULLY. Note to self, next year drop him off across the street and make him walk across, Wowzers. 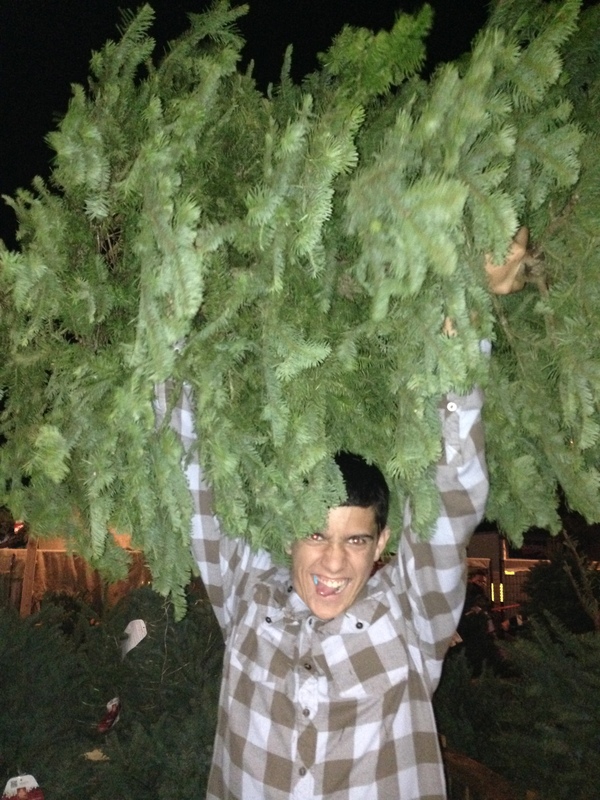 Thanks to Nick’s fabulous camera phone, we have photo documentation of the ol’ tree picking. 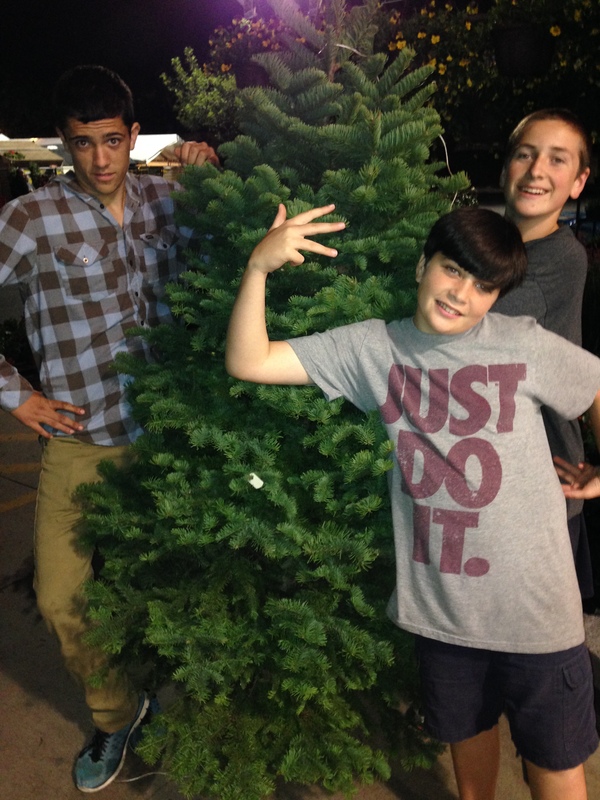 Joe is the picker outer, Tony is the heavy lifter, and Nick is the comic relief for this particular activity. In and out in 10 minutes! All is right with the world. 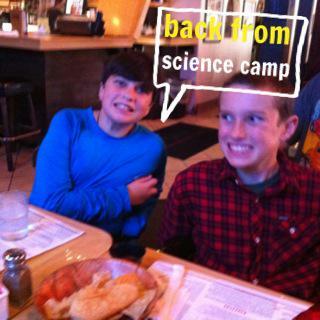 Joe made it back from 6th grade science camp in one piece. He did however get off the bus in his way baaaack up sweats that are actually Nick’s, a bit long in the ol legs. Hubba Picked him, and his buddy Matthew up, and they headed straight to Mi Casa for some mexican food. Man those were some long days without him. His big news is he discovered how to roll his R’s and he is sharpening his technique by practicing. It’s driving Hubba and Nick bonkers. I’m just happy he’s home….he can fart the alphabet for all I care!!! 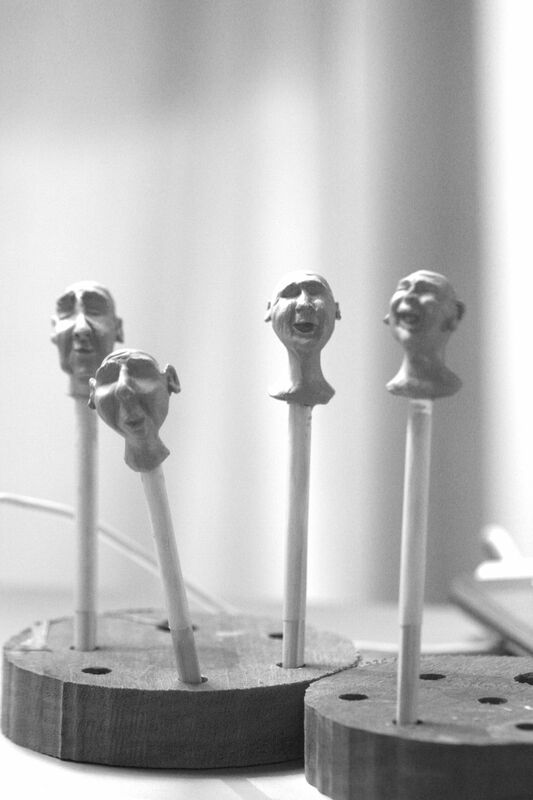 Hubba has sculpted four more miniatures. I can see the optimism in my husband in the way his mini faces turn out. They are so darm cute. His mom will fire the porcelain, paint, dress the dolls and sell them to collectors. 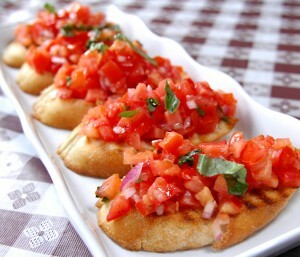 My name is Julie and I’m addicted to my husband’s bruschetta. This is not a picture of my husbands because the minute is puts it down in front of me I gobble it up. And it is what I had for dinner last night. And I was happy. 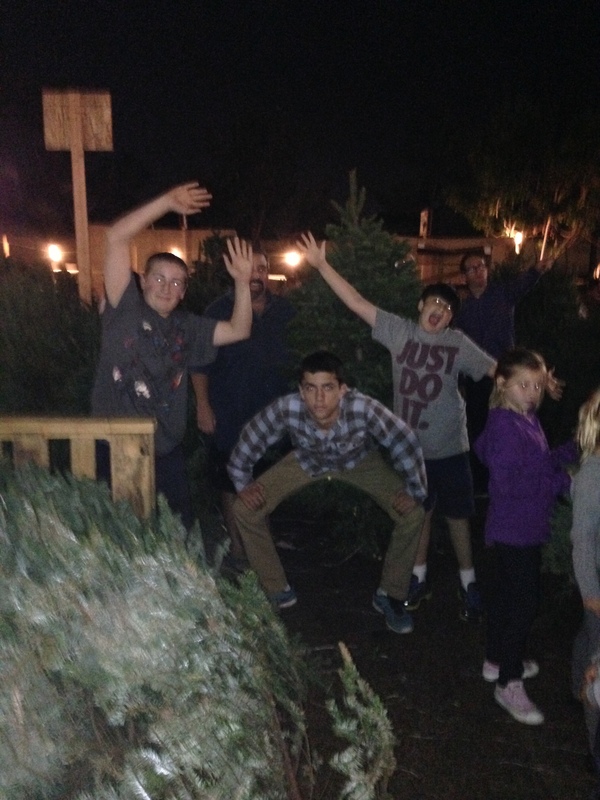 Joe’s at science camp and I feel like I’m missing an elbow….Our house isn’t right with him gone. I think that’s why I got the bruschetta, for 10 minutes I stopped saying, “man, I miss Joe”. My husband is too good to me.